I've tried using c-sync, same thing. I think I just have to put a switch in that connects and disconnects the Y input to the Jungle chip. Perhaps this could be a good use of a 2 point switch to turn on blanking and disconnect Y at the same time. A buddy found the below CRT in a dumpster outside an office building. He talked to a maintenance guy or something at the building, and he was more than happy to let him pick through their recylcing bin, since it would save him some money on having to get it recycled. The story behind it is it's a low usage screen that was only used for weekly presentations. My buddy grabbed it because its in great shape, and firing it up when getting it home, it works perfectly. I'm hoping this one is a good candidate for modding, but the user manual is not helpful, and the only possible schematic or service manual I can find is something that has to be paid for. Anybody have any useful information on this one? I asked my buddy to open it up and start taking pictures so I can ID the jungle IC, but that hasn't happened yet, and I'm hoping to have schematics to cross reference. Still working on making everything look nice but getting clean RGB is finished! I definitely recommend modding this chassis if you can get your hands on one. Fairly simple to do. Tracing the board to find all of the ports is what took the most of my time. For the "large resistor" you talk about on the blanking line, any resistor from 470R up to around 2700R should be fine for that. Glad you got a great result for your persistence. Persistence is a key skill for this hobby. One of these days, I'm going to have to try this with the 27" JVC D-Series sitting in the basement. The mod doesn't look to difficult to perform compared to some other sets. 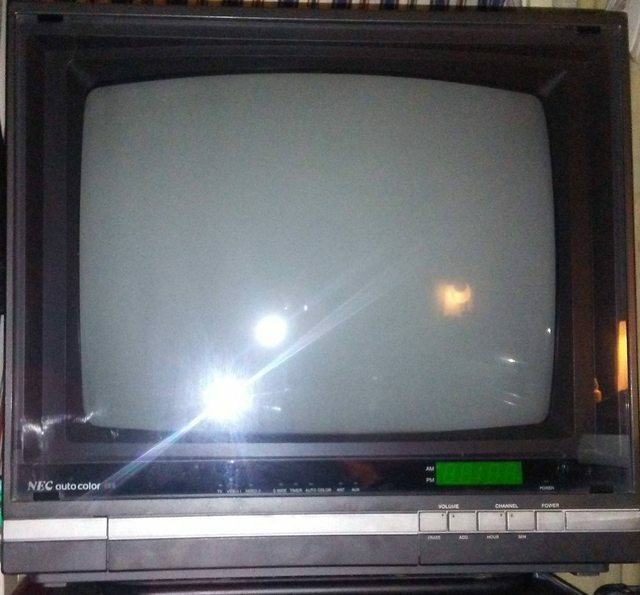 Ok i know am currently working with an Akai TV, but someone just offered me a Sony KV-24FV12. I tried searching the forum to see if anyone had mentioned this TV before but it didn't turn up anything. I thought i was good at identifying TV's that Could be modded but it still seems I've got more to learn. I see the jungle with RGB IN but don't see any blanking or even where is ties in with the OSD to do the Switch method. Ok I've been modding some of my console systems for a while now and now that I'm done with that, I want to re-investigate this Sony CRT. I want to try the Mux method but I'm still not very skilled in electronics, I took Your (MarkOZLAD's) calculator spread sheet and tried my best to make sense of it. See the pictures for what I've come up with and let me know if I'm anywhere near right. Full tv service manual link is above in the quotes if you need it, page 32 i think. Parts that confused me were about everything on the blanking line (pin 49) there's a capacitor in circuit with a 1k resister which both exit out through the diode and also close to the jungle chip, a coil inductor before the 100 ohm resister. I just added the 1k resister to the 100 ohm resister that I found on the line returning to the jungle chip.., is this correct? I just noticed pin 41 also goes the the blanking in on the jungle.. optional line? Hey guys, what a great thread this is. Seems like I am in a similar situation all around as the old mate Sammickk. I have an old Akai that I had planed to RGB mod but after some investigation on the IC used in it I can't see any RGB inputs. it has and OSD but seems it doesn't go in with RGB. Maybe I can mod this for S-Video.. But other than that set I have an Australian 21 inch Trinitron which should do a fairly standard rgb mod. a big Philips which has component in and a TEAC which already has a scart input.. thank the gods for that one... My plans are to use a Wii with emulation and component out on the big Philips and my Amigas on the scart TEAC, RGB mod whatever else I can find that will do it. Anyway that's just my introduction, early days for me but hopefully I have some success and can contribute to the thread. Very interesting one. I believe O-YM is setting half tone RGB and O-OSDBLK is setting full contrast RGB. A quick look at the maths of the circuits, when setting half tone we have 5V coming out from the micro controller going through a 10KR, an MA111TX diode and then has a 3.3K resistor to ground. the forward voltage of MA111TX diode is 1.2V. for O-OSDBLK we have 5V coming out from the micro controller going through a 1KR, an MA111TX diode and then has a 3.3K resistor to ground. For a quick and dirty blanking circuit I would be connecting up a switch to a 5V line and having an inline resistor of 2200R. I would connect this to either the leg of R1087 that isn't grounded or the ends of the Diodes D1012 or D1011 that are closest to the jungle. 5V * 3,300/(2,200+3,300) = 3V. As for Pins 26/27 and 28, they are connected to 9V. Not sure why this is the case. Previous posters have said that these inputs are disabled by serial comms from the micro controller. I believe one poster had success in getting these inputs enabled by turning on service mode option bits (possibly all of them to 1 if I recall). Other advanced modders have hijacked the I2C serial bus to enable the extra ports. Your use of the OSD mux spreadsheet is correct. 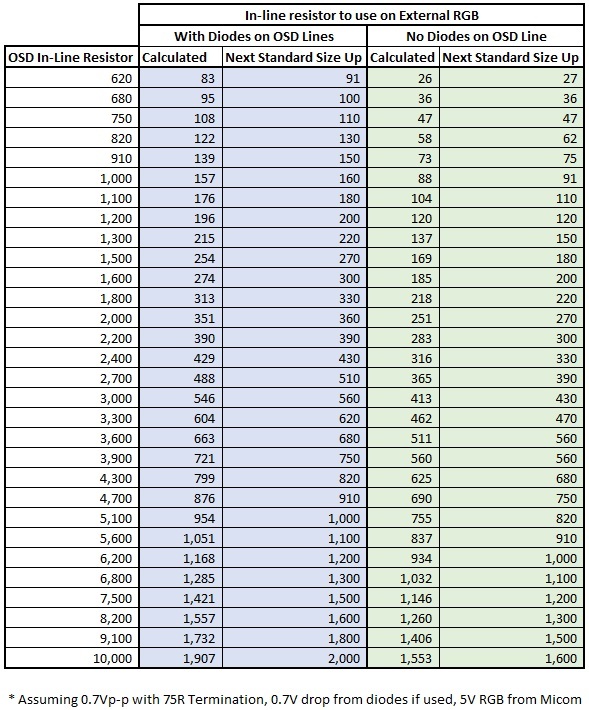 Remove R1086, R1084 and R1085 and use 1,100R inline and 75R termination. For blanking id feed the blanking scart pin directly to the blanking leg. Is a TV with this jungle IC a good candidate for RGB modding? If I'm understanding everything I'm reading so far, it is, but just want to be sure from the experts. I scored for free a 1983 NEC CT1901A crt and it works great and has two composite inputs. It obviously has no OSD,it sports a HA11436A for video and pins 15 through 17 are the rgb outputs that goes to the neckboard. Here's all of the info I could find on the IC. You guys this I should just let this tv be. I'm in East coast America. I had A CFT2490 manufactured in 2002. It had an unpopulated scart port near the rear of the TV. There for all i had to do was trace the scart lines back to the jungle and make sure the proper components were in place, and all but one resister (i think it was on the scart fast switch line scart pin 8 i beleive) was already in place ready to go! Therefore there was no need to mess with the OSD chip basically all I had to do was wire up a scart connector and install one resister and I was ready to go. You may have an unpopulated scart port already in place like I did. Crack it open and take a look on the underside of the board. From the information you've provided this is not a candidate for modding via Jungle RGB input insertion. 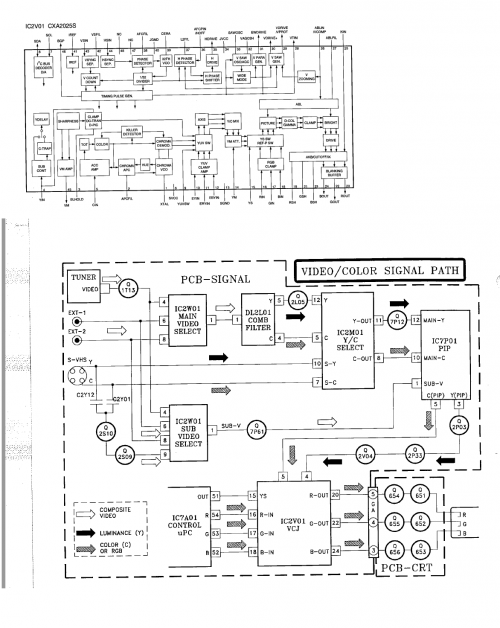 next link is for chassis schematic and jungle schematic but i dont seem to find info about blank max voltage. i did some testing first. Yeah,guess my only option would be to go to the neckboard but I'm not skilled enough to go that route. Last edited by HellRazor on Tue Feb 19, 2019 4:25 pm, edited 1 time in total. Ill be looking into making up a board suitable for neckboard modding soon. Will be based off something like an old arcade monitor IC with clamping. No idea how it will turn out. so I attempted my first mod of a sony 27fs100 by lifting the pins on the Jungle IC, and damaged it beyond repair. I'm trying again however, this time with a 27KV300. The goal is to drive the tube using GroovyMAME and crt_emudriver for use as a pseudo-arcade monitor for MAME / Arcade emulators. I'd like to go with the RGB Mux/mix method, and avoid lifting the pins on the jungle this time. There are a billion exposed jumpers on the topside of this board, so I'd love to find a place to tap in there if possible. I just don't know how to identify them on the diagrams, so I'm unsure where i'd go in. I'm already planning on using the luma and gnd pins on the S-Video connector for the Sync and Ground from the VGA side..
Based on the diagram, I'll be going in through 40 (blank), 41(B), 42 (G), 43(R). If I were to try this the old way, I'd have 75ohm resistors to ground on each of the R,G,and B lines coming in from the VGA connector, and a .1uF cap on each of the R,G, and B lines. That woudl, however, be going directly into the jungle chip. If I'm going in another way, I understand I'll hvae to calculate values, but I believe that depends on where I'm going in, and I'm not quite sure where to start. Any help or guidance would be appreciated on this. 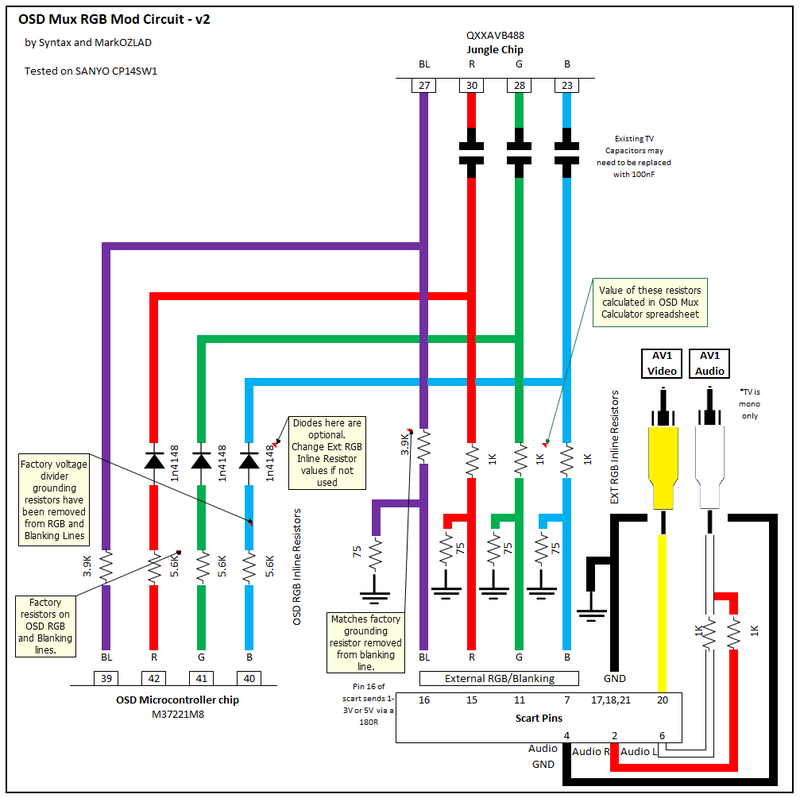 There are a set of jumper wires on the OSD RGB lines that can be used as our RGB injection point or the solder points from the removed resistors"
"5V on Diode leg from OSD Ys. Could possibly put Scart pin 16 to L304." Note that I haven't modded this chassis (we don't have them in Australia) I have just studied the schematics. No guarantees. To find the jumpers you'll need to study the chassis/schematics, get out the multimeter and find them. For the broken legs off the other TV, you can dremel/grind the top of the chip to expose more of the chip legs and solder wires. m.andrade1 successfully achieved this. I think he used solid wires from SATA cable. Jungle is IC200 TDA8375. Microcontroller is IC100 L864128. OSD External RGB Mux method for this one. Remove R107, R108 and R109, we will use the holes left by these resistors to implement the OSD mux. Twist together the legs of (three) 1KR and 75R resistors. Solder the free leg of the 1KR resistors into the holes that have traces that go to the jungle. Solder the free legs of the 75R to the holes that are connected to ground. Connect your RGB wires to the twisted legs. For a simple blanking circuit connect a 5V line to a switch and then to a 680R resistor (a 1KR and the connect to the leg of R110 that is farthest from the micro controller. 5V can be found on leg 8 of IC102. Should be very similar to the 8-Bit Guy's RGB mod. "should i inyect it in a classic way? (like post 1 in this post?) "
Post 1 of this thread is obsolete. OSD Snip method is obsolete. I will definitely be giving this a shot, hopefully this weekend. If I can trace the correct jumper wires I'm happy to report back which they are / how they are marked. Will be picking up the necessary resistors tomorrow. So, this is likely a pathetically ignorant question, however... : -- if I'm removing the resistors on those OSD lines, should I be bridging the pads with a jumper wire? >So, this is likely a pathetically ignorant question, however... : -- if I'm removing the resistors on those OSD lines, should I be bridging the pads with a jumper wire? Those resistors make up th “R2” of the voltage divider. The resistors we will put on the External RGB lines will perform this function in their stead. Awesome Syntax,looking forward to it. yes i watched the video and its the same chassis i have . lucky me! Yes, it is moddable. Ba-5D chassis. See the modding notes a few posts up about this chassis.